Recently reduced from 139,500 euros, this super two bedroom ground floor bungalow / apartment is offered for sale direct from the owner in the ever popular Playa Flamenca urbanization on the Orihuela Costa, Costa Blanca, Spain. For sale fully furnished and equipped this fine property is on the Parque del Duque complex with a lovely communal swimming pool and landscaped gardens, it is air-conditioned and has satellite TV installed. The property is handily placed for local bars and restaurants and is just a short walk from the well known Saturday market, one of the best in the Orihuela Costa area. Nearby are the beaches of Playa Flamenca, La Zenia and Cabo Roig, plus the many facilities of these 3 resorts. Also ideal for golfers, there are 5 courses within easy driving distance of the property and these are some of the best courses on the Costa Blanca. The asking price for this property in Playa Flamenca is just 100,000 euros. Recently reduced property bargain for sale in the Costa Blanca resort of Cabo Roig. 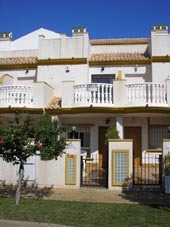 Fully furnished two bedroom townhouse has been reduced by 50,000 euros and is now priced to sell. Property comprises 2 bedrooms, bathroom, WC, lounge/diner, separate kitchen, tiled back patio, tiled front garden, tiled balcony from main bedroom, solarium offering sea views to Campoamor and La Manga, air-conditioning, satellite TV, communal pool and gardens, close to shops, bars and restaurants, close to seafront, easy driving distance to 2 airports, short drive to large town, short drive to Mar Menor, walking distance to beach. Previously priced at 225,000 euros this property in Cabo Roig is now offered for just 175,000 euros. A great bargain currently on offer direct from the owner (FSBO) is this 2 bedroom first floor apartment/bungalow on the popular La Cinuelica complex, in Los Altos, Punta Prima, Orihuela Costa, Spain. With lots of extras this super apartment is offered for sale fully furnished and equipped and ready to move into. It has 2 bedrooms, lounge / diner, kitchen, galleria / utility area, terrace covered in with good quality glass curtains, air-con, and benefits from the use of communal pool and gardens. The apartment is just a short walk from the amenities of Punta Prima, where there is a good choice of supermarkets, shops, bars and restaurants, also close by are the beaches of Punta Prima, Torrevieja and the Orihuela Costa. Alicante airport is only 40 minutes drive away and Murcia (San Javier) airport is even closer at 25 minutes drive. The value asking price for this Los Altos apartment is just 95,000 euros, cheaper than many less well appointed properties in the area, so be sure to call the owner Colin today on (0034) 659 637 255 or (0044) (0)1612984476 to arrange a viewing. Los Altos Map. Finca / country house for sale which is in need of renovation and located about 5 kilometres from the town of Aspe on the Costa Blanca, Spain. Current build area of 53 square metres on a plot of 6000m2, the house comprises two bedrooms, lounge / kitchen / diner, bathroom, terrace, garden, wine store, is fully furnished, with white goods, water deposit (70,000 litres), south-facing, tarmac approach road, panoramic views of surrounding mountains and countryside. Aspe is a small town situated on a tributary of the Vinalopo River between the towns of Elche and Novelda, it is a mostly agricultural area growing grapes for the production of its famous local wines, the town has a population of about 18,000. The current asking price for this finca in Aspe is 173,000 euros. Aspe Map. Spacious 2 bedroom holiday apartment available for rent in Punta Grossa, close to the beautiful resort of Arenal d’en Castell on the northern coastline of the island of Menorca (Minorca) in the Balearic Islands, Spain. Offered for rent by the owner this super apartment has 2 bedrooms, 1 bathroom, lounge with fireplace and dining area, equipped kitchen, terrace with seating, use of communal swimming pool, sofa bed provides extra sleeping enabling apartment to sleep up to 6 people. Arenal d’en Castell is situated on a picturesque bay and has a safe beach with shallow, warm waters and a good range of facilities, it benefits from a fine climate and Arenal d’en Castell weather is ideal for summer holidays, though it can get chilly during the winter months, as it does in all of northern Minorca. Holidays are offered in this Arenal d’en Castell apartment from just £200 -£525 per week. Arenal d’en Castell Map. Three bedroom detached villa for sale near to the village of Alcaucin in the Malaga province of Andalucia, Spain. Brand new villa on a plot of 1200 square metres with 3 bedrooms, lounge /diner, kitchen, terrace, fireplace etc, the villa enjoys views over Lake Vinuela. Alcaucin is a pretty little village about 54 km from Malaga on the lower slopes of the Sierra Tejeda mountains. A perfect opportunity to own a property in Andalucia at a reasonable price in this charming area within about 25 minutes drive of the coast at Torre del Mar. The current asking price for this property is just 325,000 euros. Andalucia Map. Splendid one bedroom apartment for sale in the tranquil resort of Alvor on the Algarve Portugal. Situated on the second floor this fine apartment comprises one bedroom, family bathroom, fitted kitchen, lounge / diner and is offered fully furnished and equipped. The apartment is just five minutes from the nearest beach and also from the town centre of Alvor itself, it is ideal for golfers as it is only a short distance from the Alto Golf and Country Club, with a couple of other fine courses nearby. Alvor is a historic fishing village which has become a popular resort whilst keeping its traditional fishing village charm, it benefits from a super climate and Alvor weather is some of the best on the Algarve boasting an average of just 17 days of rainfall per year. Alvor Map. Luxury villas for sale on the Almanzora Golf Resort (Desert Springs Golf Resort) on the beautiful Costa Almeria region of southern Spain. Superb detached villas for sale by agent, built in authentic Spanish rustic style and boasting 4 or 5 bedrooms, 4 bathrooms, air-conditioning, large underbuild (ideal for games room or home cinema), underground garage, 10m x 4m swimming pool, Properties are nestled between the sea and the mountains on this amazing golf resort, with a course built to USGA specifications in a unique setting, with over 1 million plants from all over the world. The Almanzora Golf Resort is located inland from Mojacar and Garrucha on the Costa Almeria, and enjoys the wonderful Almeria weather, in a fantastic rural setting, on this , the only desert golf resort in Europe. These fantastic Almanzora Golf Resort villas are currently available from 855,000 euros. Costa Almeria Map.